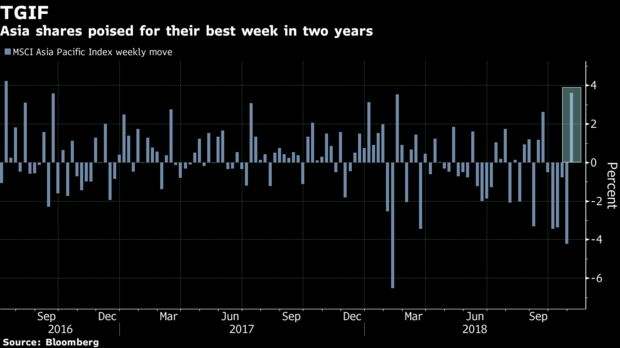 There’s no shortage of superlatives to describe this equity rally: best four-day gain in more than two years, best week since February, first gain in six weeks and higher trading volume across the board. All it took was one telephone conversation between the leaders of the world’s two largest economies. After their first publicly disclosed phone call in almost six months, Donald Trump said his Chinese counterpart wants to make a deal to end an escalating trade war. That sent the Shanghai Composite Index soaring, following this week’s hints from the nation’s leadership that additional stimulus measures may come soon. The Hang Seng Index rallied even further, with a jump of as much as 2.7 percent. Even Apple Inc.’s lackluster earnings results didn’t dampen the mood. While some of the company’s suppliers fell in early trading, tech companies in the MSCI Asia Pacific Index topped all other sectors Friday, rising as much as 2.4 percent. Chinese President Xi Jinping held a forum with officials from some major domestic private companies and pledged a better environment for them. With promises of tax cuts and financial support for non-state owned firms, the ChiNext Index rallied as much 3.8 percent, dwarfing the Shanghai Composite’s gain. South Korea’s Kospi index jumped the most in more than a year as earnings from companies such as Daelim Industries and GS Retail beat expectations, a decline in the price of crude sent petrochemical makers soaring, and China’s stimulus plan sent metal-related stocks higher. Japan telcos rebounded after KDDI said it wouldn’t follow NTT Docomo’s mobile plan price cuts and confirmed reports it would tie-up with market newcomer Rakuten. The U.S.-China trade progress also lifted sentiment. The Nikkei 225 Stock Average came close to erasing Thursday’s loss. The week isn’t over yet. Malaysia’s 2019 budget is set to be released later Friday, and equity investors will be keeping a close eye. Last month, the nation’s benchmark FTSE Bursa Malaysia Index plunged 3.7 percent in two days after Prime Minister Mahathir Mohamad said the government will devise new taxes soon to shore up a state budget that’s been constrained by debt and changes to the consumption levy. There’s also the U.S. jobs report, the final one before next Tuesday’s congressional elections, which may show that hiring improved and the unemployment rate held at a 48-year low.